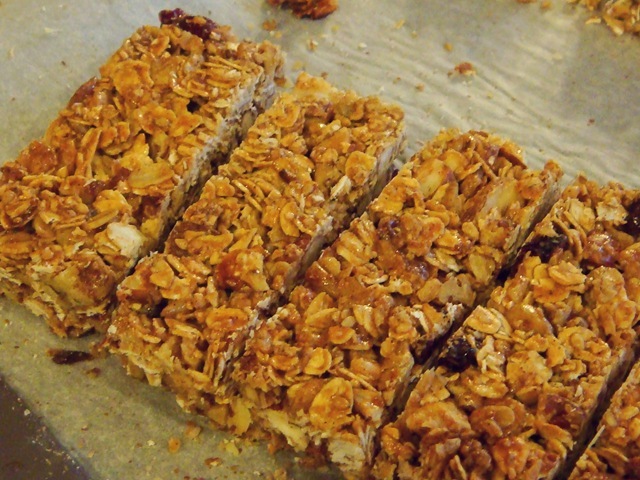 Homemade chewy granola bars: A fraction of the cost of store-bought bars, and so much tastier! Not to mention healthier. I never mention that part to my kids. I used a combination of oats, almonds, pecans, Rice Krispies (to make them a little less dense), sunflower seeds, sesame seeds, raisins and dried cranberries. I like to toast the oats and raw chopped nuts before mixing with the other ingredients. I use kind of a “shortcut” step when making these. Instead of cooking a syrup to bind the bars, I use a can of sweetened condensed milk. Doesn’t everything taste better with a little sweet milk mixed in? To avoid sticking: Spray the back side of a spatula with non-stick spray and use it to press granola bar mixture into a baking sheet lined with parchment paper. You could also just spray your hands and use them to press the mixture into the pan. Bake at 350°F for 20-25 minutes, or until top just begins to brown. Let cool in pan for 10-15 minutes, and then use parchment paper to lift cooked bars out of the pan. Be sure to save all of the “crumbs” after you cut the bars. These are great over a bowl of yogurt! Spread oats evenly on a rimmed baking sheet (about jellyroll size, 10×15”). Toast in the oven for about 5-7 minutes. Place toasted oats in a large mixing bowl. If nuts/seeds are raw (not roasted), toast them on the same baking sheet for 7-10 minutes. Add to mixing bowl with oats. Stir in additional dry granola items, cinnamon and salt; mix lightly. Pour sweet milk, maple syrup, honey or molasses, and coconut oil over granola mixture. Mix well. Line your baking sheet with parchment paper, letting it overlap the sides. Spray the back side of a spatula with non-stick spray and use to press granola bar mixture into lined baking sheet. Bake at 350°F for 20-25 minutes, or until top begins to brown. Cool. 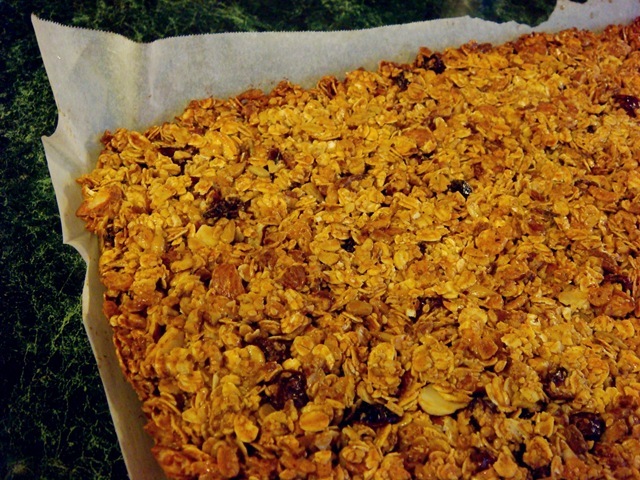 Lift parchment paper (and granola bars) out of baking sheet. Cut into bars. Store between layers of waxed paper in an airtight container. Cut granola bars can also be frozen in Ziploc bags. 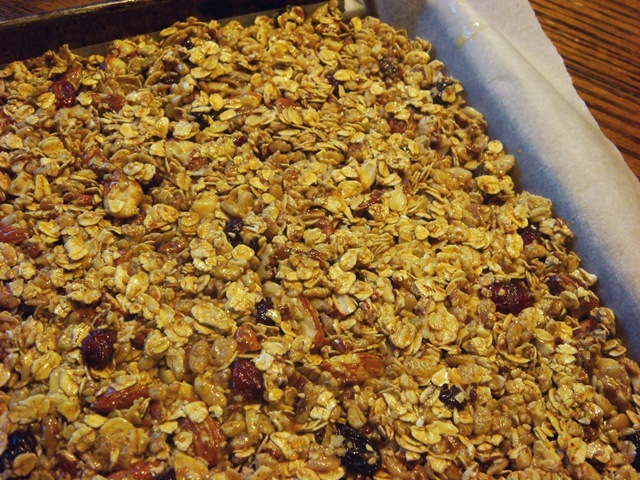 I doubled this recipe and made them in a large 15×21” pan and got about 80 granola bars. You can use any vegetable oil, or a mild tasting olive oil. Did you double the sweetened condensed milk when you made the double batch? Yes. Sorry if that was confusing. 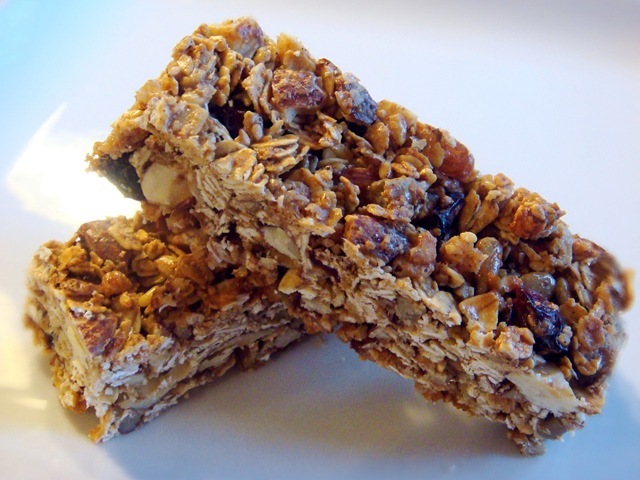 I was just indicating what combination of dried ingredients that I used in the granola bars pictured. If you are doing a double batch, you would need to double all of the wet ingredients and the salt and cinnamon (if you are using) as well.